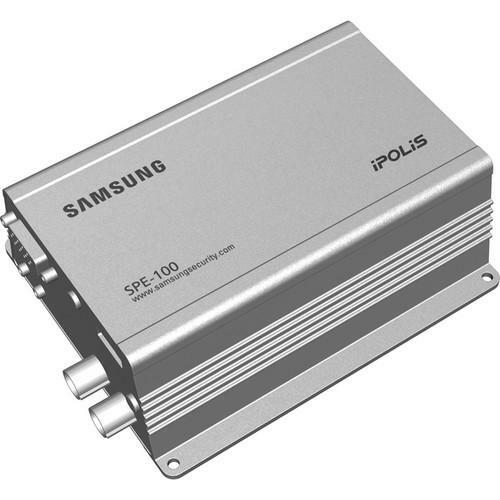 We recommend checking out our discussion threads on the Samsung 1 Channel H.264 Network Video Encoder SPE-100, which address similar problems with connecting and setting up Video Encoders & Decoders Samsung. The user manual for the Samsung 1 Channel H.264 Network Video Encoder SPE-100 provides necessary instructions for the proper use of the product Surveillance - Surveillance Video - Video Transmission - Video Encoders & Decoders. The Samsung 1 Channel H.264 Network Video Encoder encodes a single channel of analog video and audio for transmission over a network. Along with converting A/V signals, this unit will digitize the PTZ control signals of a dome camera connected to its RS-485 control port. Multi protocol PTZ support enables interoperability with third party CCTV controllers and DVRs. Video is encoded using the H.264 compression format at up to 30 fps at 4CIF resolution, ensuring quality video images while maximizing bandwidth usage. Video can be simultaneously streamed to multiple destinations, with each stream individually adjustable for frame rates and resolution to suit different security and network requirements. MJPEG and MPEG-4 compression methods are also supported for greater versatility. Conformance to the ONVIF (Open Network Video Interface Forum) protocol standard enables easy integration with third party network video products. This encoder features RCA audio in and out connectors, which when used with an appropriate mic and speaker will allow 2-way voice communication over the network. This encoder features an on-board SD/SDHC card slot which can be used for local storage and as a means of backup in case of a network failure. There are also alarm I/O ports for interfacing this encoder with an external alarm and relay device. Alarms alerts can also be triggered by the encoder's built-in motion and video loss detector. With the addition of a PoE midspan, this encoder can be powered via its Ethernet cable. By eliminating the need to run a separate power cable to the camera, PoE saves time and installation costs. If you own a Samsung video encoders & decoders and have a user manual in electronic form, you can upload it to this website using the link on the right side of the screen. Box Dimensions (LxWxH) 7.4 x 5.1 x 4.4"
The user manual for the Samsung 1 Channel H.264 Network Video Encoder SPE-100 can be downloaded in .pdf format if it did not come with your new video encoders & decoders, although the seller is required to supply one. It is also quite common that customers throw out the user manual with the box, or put the CD away somewhere and then can’t find it. That’s why we and other Samsung users keep a unique electronic library for Samsung video encoders & decoderss, where you can use our link to download the user manual for the Samsung 1 Channel H.264 Network Video Encoder SPE-100. The user manual lists all of the functions of the Samsung 1 Channel H.264 Network Video Encoder SPE-100, all the basic and advanced features and tells you how to use the video encoders & decoders. The manual also provides troubleshooting for common problems. Even greater detail is provided by the service manual, which is not typically shipped with the product, but which can often be downloaded from Samsung service. If you want to help expand our database, you can upload a link to this website to download a user manual or service manual, ideally in .pdf format. These pages are created by you – users of the Samsung 1 Channel H.264 Network Video Encoder SPE-100. User manuals are also available on the Samsung website under Surveillance - Surveillance Video - Video Transmission - Video Encoders & Decoders.